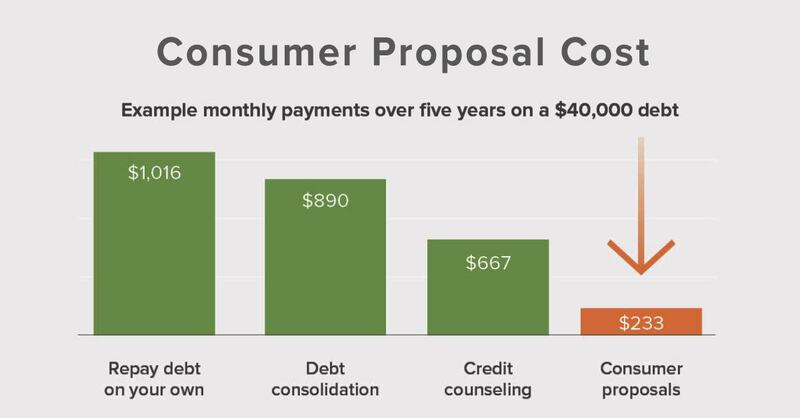 What is a Consumer Proposal and How Does It Provide Debt Relief? A consumer proposal is a legally binding debt settlement arrangement filed with a Licensed Insolvency Trustee to repay your debts for less than you owe. The savings can be substantial. It is not unusual for someone to reduce their debts by as much as 70%-80%. In exchange for making your agreed upon payments, you keep your assets and eliminate your debt. A consumer proposal works as a debt relief solution because it is a program sanctioned by the Canadian government. Filed under the Bankruptcy & Insolvency Act it is a legislated program in Canada that provides a debtor with significant advantages over any other debt management program by providing both creditor protection and debt relief. When you file a debt proposal through an LIT, acting as a consumer proposal administrator, you immediately receive legal protection from your creditors. Why is a consumer proposal the best bankruptcy alternative? all unsecured creditors are legally bound by the terms once accepted. Because you settle your debts, it’s often possible to negotiate payments that can be 75% or more less than you were paying on your debts before. Settlements of 30 cents on the dollar are not uncommon however every debt proposal is different. Ultimate settlements depend upon you income and what you own. Every proposal to creditors is unique. If you have more debt than you can handle, a consumer proposal is usually the lowest cost debt relief option. A consumer debt proposal is a deal to eliminate your debts. Your payments are based on a negotiation between what your creditors expect to receive and what you can afford to repay. In most cases, this results in a payment that is much lower than any other debt relief solution. To compare possible payments in a consumer proposal with other options, try our consumer proposal calculator. What your creditors might receive if you were to file for bankruptcy. This is the starting point of negotiations. What certain creditors might expect as a minimum payout. An experienced Licensed Insolvency Trustee knows, based on past plans, what certain creditors expect. What you can afford to pay each month. This will help determine how long your proposal will last. You can spread out your negotiated settlement amount for up to 5 years, interest free. Another advantage of a consumer proposal over other debt settlement programs, and over credit counselling, is that once accepted, your proposal is binding on all your creditors. That includes payday lenders and Revenue Canada who will not participate in any informal debt settlement program. Even if one creditor votes no, if the majority of creditors vote to accept the proposal, it is binding on everyone. That means all your debts will be eliminated. You will not be left with one to two debts to deal with on your own. What Debts Are Included in a Proposal? A consumer proposal does NOT affect your mortgage or secured car loan. Who can qualify for a Consumer Proposal? The best way to determine if a consumer proposal is the right path forward for you is to have a free confidential consultation with a Licensed Insolvency Trustee. As a federally regulated program, proposals have specific requirements you must meet as defined by the Bankruptcy and Insolvency Act. You must be a resident of Canada or have property in Canada. Citizenship is not a requirement to file a consumer proposal. You can be a permanent resident or residing in Canada under a work permit or other immigration status. As long as you have Canadian debts you need to eliminate and have income or assets in Canada you can consider a consumer proposal to deal with those debts. We meet with people every day who need debt relief but have an honest desire to repay as much as they can afford. A consumer proposal allows them to avoid bankruptcy and have the satisfaction of knowing they repaid what they could. In Canada, consumer proposals can only be filed with a Licensed Insolvency Trustee. Credit counsellors and unlicensed debt consultants cannot legally provide consumer proposal services. All they can do is refer you to a trustee licensed by the federal government like Hoyes, Michalos. You do not need a referral to an LIT (formerly called a bankruptcy trustee) and you should never have to pay an outside consultant to help you prepare any paperwork. As a Licensed Insolvency Trustee, Hoyes Michalos is licensed to file consumer proposals.